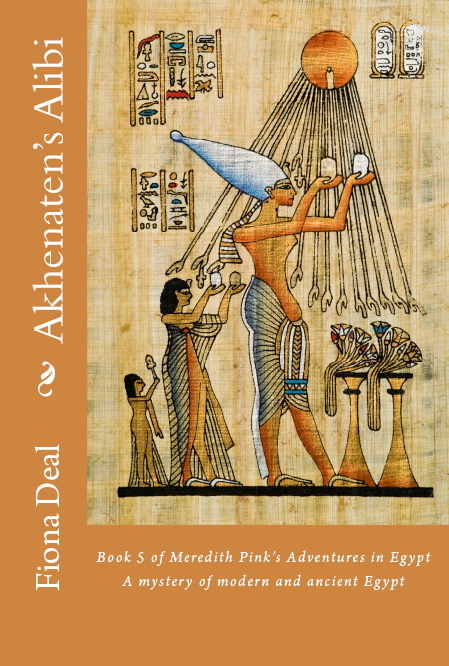 I’ve just published Akhenaten’s Alibi, the fifth book in the series following Meredith Pink on her adventures in Egypt. It’s set against the backdrop of the turbulent events of the summer of 2013, when the people of Egypt took to the streets to protest the ‘undemocratic rule’ of their first democratically elected president, Mohamed Morsi. This resulted in a coup d’etat that ousted him from power. As I’ve mentioned before, it seems there really is nothing new under the Egyptian sun. Some scholars claim the first coup d’etat took place in Egypt over 3000 years ago. Back then it wasn’t a democratically elected president but a divinely anointed pharaoh who was allegedly forced to abdicate his position. The pharaoh in question was Akhenaten, arguably the most intriguing of all the pharaohs. He ruled towards the end of the golden age of Egypt’s empire in the 18th Dynasty of the New Kingdom. Some say he catapulted it into decline. He has been called ‘the first individual in history’. It’s not hard to see why. Unlike the traditional statuary and tomb-and-temple carvings that remained largely unchanged over a passage of time spanning upwards of 2000 years, Akhenaten’s is unique. For reasons that remain obscure, he chose to have himself represented artistically with an elongated and distorted body shape and with exaggerated and unflattering facial features. What we know for sure is that he led a religious revolution, breaking with centuries’-worth of uniformity and consigning the ancient Egyptian pantheon of gods and goddesses to oblivion. Instead he elevated the Aten, the sun disc for sole worship. 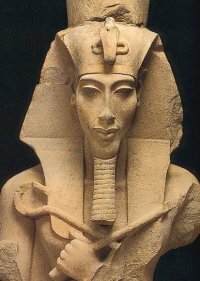 The big questions this begs … was Akhenaten the first monotheist in history? Did he pave the way for the great monotheistic religions of the world… Judaism, Islam and Christianity? Was he a contemporary, or perhaps an inspiration for Moses? Opinion is divided. Some claim Akhenaten was an enlightened spiritualist, born before his time. Others that he was an autocratic despot who imposed his thinking on a resistant populace. So, was Akhenaten ousted from power by a people unwilling to accept his unilateralism, in the way Morsi was? Or did he die a natural death? Were his beliefs kept alive by a small band of his followers, who handed them down perhaps until the Qumran Essenes set them down in the earliest biblical writings, the Dead Sea Scrolls? Posted on August 4, 2014 by Fiona Deal. This entry was posted in ancient Egypt, Egypt, egyptian fiction, fiction, History, Travel and tagged Akhenaten, ancient Egypt, egypt, Morsi, Moses. Bookmark the permalink.